Many people are familiar with the Mozzarella alla Caprese dish that you can order as a first course in Italian restaurants such as Graffiti's, or you may have made it at home with your own fresh tomatoes. I myself have never made this with strawberries until I saw them sampled at The Fresh Market one day. And oh how glad I am that I tried them! I am the marketer's dream shopper. My best friend Joe once told a lady at a store, "All you have to do is show it to her." Yes, I have a shopping problem. So put out your samples, and I will buy. This is made of cigliene, or small cherry - tomato sized fresh mozzarella that you can find at The Fresh Market or even at Kroger Marketplace. Combined with the sweet strawberries, balsamic glaze, and basil, they are as tasty to eat as they are to look at! This was a great brunch for us this morning! 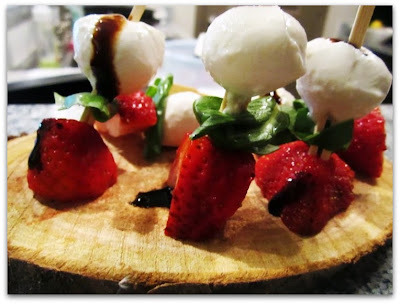 Just get your ingredients and put them together on a toothpick or skewer. Finish with a drizzle of balsamic glaze. (I found mine in the vinegar & oil section at the store.) I hope you'll find this to be a very refreshing twist! Love this! Your photos are so good ---- as usual! Different dishes are cooked in different countries. There is variety of dishes which people can enjoy in the restaurants of different countries. People are using strawberry also to make delicious dishes and they like to attract others with such dishes.